This week's fish is in equal parts weird, spectacular and enigmatic. 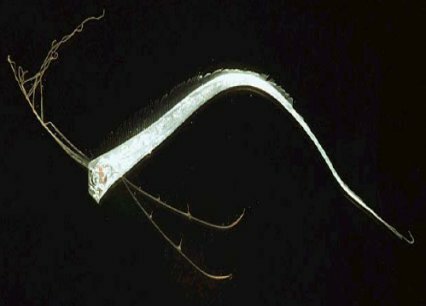 The Giant oarfish, Regalecus glesne, is surely one of the strangest yet most beautiful fish of the world's oceans. Growing up to 17m/56ft in length, they are the longest bony fish in the world - but very little is known about these rarely seen giants. Generally only observed close to the surface when dead or dying, their enormous, scale-less, metallic silver and black striped body in combination with a bizarre red dorsal fin and 'crest' are believed to have accounted for many historic sightings of "sea serpents". Their common name of "oarfish" is thought to be derived from their long, flattened body or the erroneous belief that in the absence of a significant caudal fin that they "rowed" themselves with their pectorals. In fact they have been filmed swimming using an undulating motion of their enormously long dorsal fin which has around 400 fin rays. Their other common name of "King of the Herrings" comes from fishermen sighting them near shoals of the fish which they believed were being led by the giant - it's scientific name also alludes to this, Regalecus being derived from the Latin 'regalis' meaning royal. They feed largely by straining zooplankton for euphausiid crustaceans (commonly known as krill), but also take small fish, squid and jellyfish. Distributed worldwide in tropical and temperate oceans, living largely in the mesopelagic zone between 200 and 1000 metres down, they are occasionally caught commercially but are of little value due to the gelatinous consistency of their flesh. This is a juvenile specimen, from the NMFS-PIRO Observer Program, NOAA. The above etching is of an Oarfish that washed ashore on a Bermuda beach in 1860. The animal, originally described as a sea serpent, was 16ft long and appeared in Harper's Weekly.